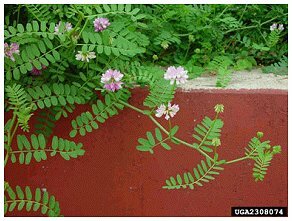 Crown vetch is a perennial legume with long trailing stems that grow from 2-6' long. In winter and early spring it is easily recognized as large brown patches because it leafs out so late. Leaves: Leaves are oval and are 2-6" long and occur in and odd number. Flowers: Flowers are pea like. They are white to pinkish purple in color and clustered in umbles of 14 to 20 flowers on long stalks. Flowers will bloom in mid-spring to mid-summer. Fruits & Seeds: Seed pods are long and slender. They contain3-7 narrow seeds each. Seeds remain viable in the soil for up to 15 years. Roots: Has fleshy rhizomes that grow up to 10' long. Roots are not fibrous, limiting the utility of crown vetch for erosion control. 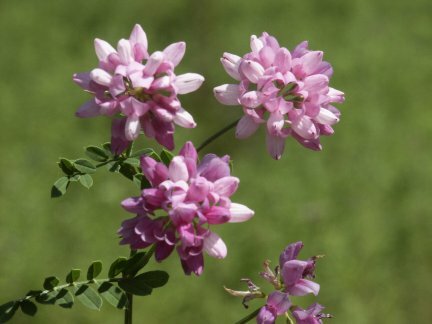 Crown vetch invades prairies, barrens, dunes, fields, and roadsides. It climbs over and shades out native plants, and it alters native ecosystems through nitrogen fixation. Fire will stimulate germination of seeds and can exacerbate invasions.